A Roman tactician once coined the maxim, "If you would have peace, prepare for war." Hence the motto of the Strategic Air Command, which was ready at a moment's notice to rain nuclear fire across the world, was "Peace is our Profession", displayed beneath a mailed fist holding both the olive branch and the thunderbolt. The message to potential enemies was painfully clear. Choose. The latter century's military history can be read to coin an equally blunt maxim. "If you would have war, prepare for peace." In the wake of WWI's horrors, America and much of Western Europe decided that nothing could be worse than a war. The remainder of that first half century would be dedicated to teaching them the lesson that there was indeed something worse than a war, and that was losing or nearly losing a war. The nations who desperately prepared for peace all through the 20's and 30's, confronted enemies willing to mime peace negotiations only long enough for the tanks to cross the border. Pacifism had ushered in Nazism. Some of the best soldiers in the Wermacht did not wear uniforms or even were aware of their affiliation. They were the idiots cheering on Aldous Huxley's anti-war speeches in a city that would not long after trade in anti-war slogans for the cries of air raid wardens. Yet enough of them, like Bertrand Russell, survived, having learned nothing from the experience and were all too eager to repeat the same thing all over again, giving up their unofficial work for the Wermacht, for their unofficial work for the Soviet Army. There is no better strategic boost to the aggression of an enemy power than an assertion that you would rather not fight. And over and over again when that assertion is made, war follows. No sane homeowner would hang up a sign in a troubled neighborhood reading, "Reluctant Guard Dog Would Rather Not Bite" or "Before You Break Into My House, Give Me a Call To See If We Can Work This Out Some Other Way." And yet First World nations keep hanging up such signs over and over again. The European nations as well as Israel are object lessons in how even the world's strongest militaries can turn into pudding in the hands of socialists who exchange the sword for the open hand. 50 years ago the sun never set on the British Empire. Today there are parts of England itself where the sun will not set on an Englishman because there are none living there anymore. 50 years ago France was debating whether to fight on in Algeria or pull out. Today the same war is no longer being fought in Algeria, but in France. At the end of the last century a Swede named Alfred Nobel felt guilty enough for inventing dynamite that he left his money to be used to distribute prizes for human achievement, including the Nobel Peace Prize by a committee of elderly Swedes operating out of Stockholm. Yet the name Stockholm is more commonly associated with the Stockholm Syndrome, a state of affairs in which captives experience greater identification with their captors, than with their rescuers. This seems appropriate enough as Stockholm today is rife with Muslim violence, rapes, murders and violent assaults are off the charts. Their justification from one survey, "The immigrant youth regard the Swedes as stupid and cowardly: “The Swedes don’t do anything, they just give us the stuff. They’re so wimpy." It makes one wonder if Alfred Nobel were alive today, whether he wouldn't find something bigger than dynamite to feel guilty over. Such as creating an entire prize to celebrate stupid cowardly wimpiness as a trait worth emulating. 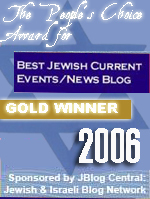 On June 9th 2005, Israel's then Prime Minister Olmert announced to the audience at the far left wing Israel Policy Forum, "We are tired of fighting, we are tired of being courageous, we are tired of winning, we are tired of defeating our enemies." Almost a year to the date, on June 12th, 2006, Hezbollah attacked Israel, kidnapping and murdering Israeli soldiers, and touching off what would be called the Second Lebanon War. A conflict that Olmert miserably bungled because he had been too tired of fighting, too busy planning for peace by retraining IDF soldiers to forcibly evict Jewish residents of disputed territories, rather than training them to fight the enemy. If you would have peace, prepare for war. If you would have war, announce to your enemies that you are tired of fighting. Teach your people that their true enemies are not without, but within in the form of nationalists, patriots, "right wing extremists" and anyone else who doesn't think peace through appeasement is feasible. Redeploy your security forces to fight the phantom threats of right wing extremism, rather than the terrorists creeping up in the night to cut your throats. War will surely follow. Israel is a case study in how a society and military capable of handling multiple enemy armies superior in size could implode within a single generation, once its government and cultural elites decided to reprogram everyone to prepare for peace. Military efficiency sharply dropped, draft dodging sharply increased, the people lost faith in a military solution, the military lost faith in a military solution, and millions waited and watched while the diplomatic representatives of a country that in its infancy had held back seven enemy armies, wrangle with the grotesque terrorist leader over the terms of their surrender, not his. A farce in the name of peace that was honored with a Nobel Prize. And now the United States is next. Say goodbye to the F-22's. We won't need them where we're going. Which is on a trip to Moscow, Istanbul, Paris, London, Cairo, Berlin and any other world capitol for heavy doses of speechmaking. Preparing for peace requires talking a lot and making grand statements backed by nothing except the puffs of hot air drifting around the hall and the obligatory round of applause afterward. There was speechmaking like that with even grander statements followed by applause all throughout the 20th century, but it was not speeches about peace that kept anyone safe, but the sacrifices of the soldiers in the field, condemned as the pawns of warmongers before they were needed, dismissed as dangerous thugs after they were done. Unregarded in life, showered with sentimental honors long after the death, by the same governments busy mistreating their own contemporaries in the field. Now as America has an administration desperately prepared for peace, the war has gotten harder than ever. The only difference is that an adoring press no longer recites the total casualty counts in an accusatory tone. The dead soldiers only mattered when their names were bullets to be shot at a conservative administration. Their usefulness have passed. Their deaths are now only an embarrassment, a testament to the fact that preparing for peace cannot hold back the tide of war. And fiscally, he was hardly conservative, although nowhere near as irresponsible as today's Democrats. I couldn't say he was among the most intellectually gifted either, while a good politician, he made terrible appointments like Condi Rice & some really awful decisions. One reason for the pacifism is the low levels of testosterone in American and European men today. The levels are down by 25% of what they were for men only 30 years ago. Another excellent article. Thanks. A response concerning the lowering of testosterone being the cause for Western Societies moral cowardice and unwillingness to fight: absolutely bogus! Was it the Ottorman Empire who used to crush the stones of certain of their warrior class? The Chinese also used eunuchs for warriors in times past. My personal opinion is that there is a heavy spiritual component involved...the dreaded G_d word arises from the mists of secular humanism and materialism, frightening the children. The politico's and front porch philosophers screech, "Anything but G_d!" Therefore, that's what we have - 'anything' but G_d! 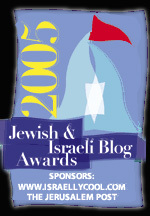 "On June 9th 2005, Israel's then Prime Minister Olmert announced to the audience at the far left wing Israel Policy Forum, "We are tired of fighting, we are tired of being courageous, we are tired of winning, we are tired of defeating our enemies." I hadn't read that before but it makes perfect sense. The PBS program NOW had a show on the second Lebanon War and the comments of many of the soldiers seemed to reflect this attitude as well, not to mention many of the questionable military tactics--invading Lebanon in broad daylight. What military launches a war in broad daylight?? It's either before dawn or aftr dusk but in any event it's dark. Also, some of the IDF soldiers said they lacked even food and water and had to go door to door asking civilians for it. Olmert's defeatism infected the IDF. I might post a clip from the show. Also, your article reminded me of the way a lot of liberal movie critics blasted the film "Home Alone" when it came out in the 1990s. It wasn't sappy enough for a Christmas movie. I guess they couldn't understand why people cheered for a little 8-year old home invasion victim who turns the table on the criminals and beats them and lives by creating weapons out of toys and anything around the house. It's really a great survival movie if you think about it. Critics blasted it until the box office numbers forced them to look at in again and try to figure out why people loved it. What would a remake look like today? 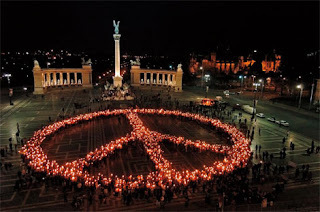 Little Kevin is left home alone at Christmas, is murdered in a home invasion and the world cries for peace and sings give peace a chance at memorials around the world. This is stage 4 of the Soviet ideological subversion of America. Unless our "leaders" are stopped, the Leninization & Soviet model of Marxist facisism in The Americas will be finalized in short order. Obama has showed his hand in the utter abandonment of democratic rule in Honduras. Am I the only one who thinks Obama has us in Afghanistan because he wants our military to lose and therefore destroy its morale? A very quick way to destroy us? Excellent read..keep up the great work! Bev, my thoughts exactly. Obama was so anti-war and that's part of why liberals elected him into office and yet he's a virtual hawk on Afghanistan. All of which makes me wonder...why? Obama's an anti-American snake and I wouldn't put anything past him. For the enemies of the United States there is no need for war--they can defeat us by waiting whilst Obama and his following turns us into another hapless Sweden or whatever Islamic-infiltrated, socialist-marxist-fascist country comes to mind. They do not have a long wait, either. Simply one of the best articles that I have ever read. You state the truth in simple terms that pacifism is not the answer but the problem. Evil must not be tolerated. It pains me deeply to be a citizen of Rome while the city is burning itself down. Will no one put out the flames stemming from appeasement and unwarranted tolerance? "The IDF had been trashed by Sharon\Olmert. Its best generals pushed out because they were opposed to Disengagement, officers were promoted based on their willingness to expel Jews and soldiers were trained to participate in expulsions, rather than to fight a war"
So true. Even PBS with its liberal slant noted and questioned why the IDF had been so ill-prepared to fight. The incompetence of the generals etc. was just too blatant to ignore, especially in a nation like Israel noted for its innovation and expertise in everything from technology, medicine, and military tactics. Here PBS was even noting the IDF's numerous other victories against greater and larger enemies than Hezbollah.